Lois came in pretty scared of everything but she is so ready to live the good life. 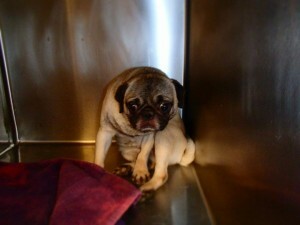 Lois is in foster care and we should hear from the foster home shortly. Lois is doing GREAT!!!! We call her Lolo though and she seems to respond better to it. At first, Lolo was very shy and timid, but she has really started coming out of her shell the past couple of days. On Monday, my brother, sister-in-law and their 13 month old daughter came for a visit. At first we were a little nervous having Lolo around the baby, but she did GREAT!!! There was no growling, scratching or other naughty things on Lolo’s part. She just sat there and let the baby pet her; they even chased each other around the house. It was VERY cute. Lolo is also getting along great with our other 2 pugs. As for potty training, she’s catching on very well and has only had a few accidents in the house. We have figured out that her que for needed to go outside is that she walking in tight circles. Lolo can go up stairs and jump up on the couch. She cannot go down stairs yet and cannot jump on our bed. Since she had so many teeth pulled, she is still on canned dog food only. We are going to start incorporating softened dry dog food soon. Lolo acts like a puppy and I think she even looks like a puppy (except for the size). When we come home, she runs all over the house and wags her tail so hard her whole body shakes because she’s so excited to see us. She also really enjoys being held, cuddling and running in the back yard. She also gets along great with our son and the neighborhood kids, so I think she would do great in a house with kids. Happily ever after story: Lola is doing well, she is learning to go downstairs. She has some separatin anxiety but she is making progress everyday. She is a sweet girl and yes she has definitely found her forever home! We love her! She goes to doggy daycare during the week with her brother Brodie, another pug!